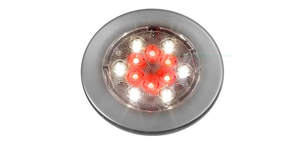 LED (light-emitting diode) spotlights are increasingly present aboard vessels because technological advances have lowered energy consumption and increased output. These fixtures are used both for interior and exterior lighting. By varying the emitted wavelength, it is possible to produce different colors without using filters. LED spotlights employ semiconductor technology. Several must be combined to achieve sufficient brightness. Today, they can emit over the entire spectrum, and white LEDs have become powerful enough to be used for illumination. Their light output is greater than that of an incandescent light of the same power. As with traditional lights, brightness will be chosen as a function of intended use. Keep in mind that decorative underwater lighting and recessed floor models must withstand higher pressure than other types.